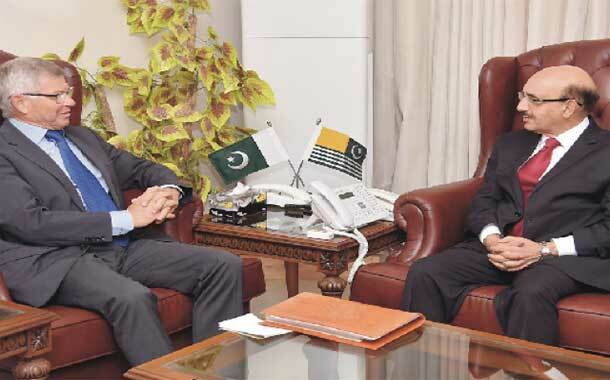 MUZAFFARABAD: Former prime minister of Norway Kjell Magne Bondevik on Sunday visited Muzaffarabad and discussed the latest situation of Indian Occupied Kashmir with Azad Jammu and Kashmir (AJK) President Sardar Masood Khan. Bondevik, who visited Azad Kashmir on the invitation of President Masood, had just returned from a visit to Indian Occupied Kashmir, where he met top Hurriyat leaders Syed Ali Shah Geelani and Mirwaiz Umar Farooq at Geelani’s residence in Srinagar. Bondevik briefed the AJK president about his visit to IOK and meeting with the Joint Resistance Leadership.Referring to a report of the United Nations Human Rights Commission, he expressed grave concern over growing incidents of human rights violations in IOK. He said that peaceful settlement of the Kashmir issue through dialogue and other means was imperative for lasting peace and stability in the region. He expressed his wish that all the parties to the Kashmir dispute, including representatives of Kashmiri people, sit together to find an amicable solution to the seven decades old conflict. During his meeting with Norway’s leader, President Masood Khan said that the grim situation in IOK required a diplomatic and political initiative by the international community to end the suffering of the Kashmiri people. “Diplomacy can help us bridge divides and come to an understanding on a just and lasting resolution of the Kashmir dispute,” the AJK president said and added that the UN Security Council Resolution on the Kashmir Dispute adopted under chapter 6 of the United Nations Charter outlined the modalities for a peaceful settlement of the issue. The president said that the unresolved Kashmir dispute was a danger to regional and international peace and security and, therefore, resort to negotiations, mediation and observation was important to break the current deadlock. “The unresolved dispute of Jammu and Kashmir poses a serious threat to peace and security and therefore, the UN Security Council cannot leave Kashmir in the lurch. It must step forward to reactivate a mechanism for the implementation of the resolution that calls for a plebiscite in Kashmir,” he emphasised. Kashmir, he said, was not just a legal dispute about territory; it is about the political destiny and future of the people of Jammu and Kashmir. President Masood Khan went on to say that Pakistan and Azad Kashmir welcomed the former Norwegian prime minister’s keen interest in resolving the dispute and assured him of full support to his initiative. “We welcome initiatives made in good faith,” he said. “Norway has a long history of constructive and impartial diplomacy and we do hope that the country will play a role in peaceful settlement of Kashmir dispute too,” President Khan said and praised Bondevik for this role as peacemaker. He said that Kashmiris strongly believed that there was no military solution to the issue and India would have to sit across the table with Pakistan and genuine representatives of Kashmiri people to work out modalities for peaceful settlement of the dispute. Bondevik also held a meeting with representatives of the AJK Chapter of the All Parties Hurriyat Conference and visited the Line of Control (LoC).